The maker of that font has a bazillion languages set in its properties. The list begins with Basque. But there are not language specific instructions. (Built with HL FC, btw). Fonts, in particular foreign language fonts that differ from the OS language sort at the end of the list. This is as it should be. Remove the list and it will sort properly. I cannot remember whom I fixed this font for in the past, whether it was here or on another forum (but as my compiled date is in 2015...). But once the list is removed--or not compiled in by removing the check in the checkbox--it will appear properly. Thanks for the suggestion, Mike, but it didn't work. 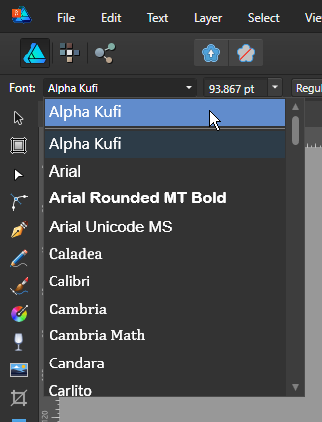 I see from your screenshot that your copy is named 'Alpha Kufi'. My copy was, and still is, named 'alpha kufi regular', and clearing the checkbox for custom naming fields hasn't affected the sort order in AD. I deleted them. Clearing the checkbox ought to work though, so it is likely a bug in FC still including the naming fields...but I would need to inspect the internals using OTMaster. And yes, as long as I was fixing it, I did capitalize the name. I'll rename it internally and see if that then is sorted out of order. As for the other thread about this font. There are 575 incomplete characters. There is no fi, etc., ligature as noted, but there also is not the Feature for ligatures anyway. As such, AF should query a font to decide what features are appropriate and turn off any that are not present. It only has kerning. Well, I am wrong once again. Yep, it'll sort at the bottom in AF, but nothing else. AF does query the features properly in my recompiled version of the original and does not muck about with ligs that are not there. Well, I am wrong once again. Hey, that's supposed to be my speciality, not yours! Yep, it'll sort at the bottom in AF, but nothing else. I think DP also used to do a case-sensitive sort, but they fixed it a couple of versions ago. Thanks for the note about the ligs.